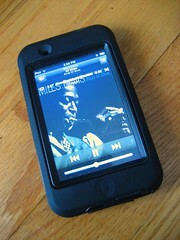 I've been thoroughly enjoying my iPod touch for the last six months, using it as a PDA, music player and web device. One of the most important accessories to choose for my touch was a case, to protect the screen and help reduce torque on the device when I pocket it. More than once, good quality cases have saved my PDAs. I wanted two different types of cases: a soft leather case for daily use, which would look professional in any situation and a hardened plastic/rubberized case for more extreme outdoor situations, like walking, hiking and so on. I contacted Piel Frama in Spain, who sent the Piel Frama iPod touch Leather Case and also talked with OtterBox, who sent two cases: the OtterBox for iPod touch Defender™ and OtterBox for iPod touch Armor™. I've used Piel Frama cases for years with my Palm devices, because they really know how to shape leather to a high-tech device, like an iPod touch. The leather is always very soft and supple, yet tough and reinforced in all the right places. After living with the Piel Frama iPod touch case (65 Euros/$95, shipping included), I've noticed the precise fit of the power button, the sync slot and headphone jack openings, how well the case's flip cover protects the screen, yet wraps completely around and out of the way, when I need it to. I carry the touch in my pocket, so I don't use the belt clip option, however there is a full swiveling belt clip option. Piel Frama also offers a variety of colors to suit your fashion taste: black, red, tan, pink, blue and green. 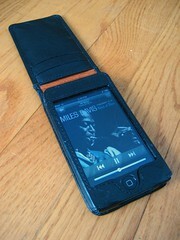 I love the Piel Frama iPod touch leather case. No only does it provide superb protection, it improves the iPod touch's grip-ability and enhances the fine design of the iPod touch itself. It's my favorite every day case. I've been aware of OtterBox's tough case reputation for a while, and finally got to try their OtterBox for iPod touch Defender™ ($29.95) with my touch. For tougher conditions, when I may be hard on the touch, the Defender works very well. The OtterBox Defender case has two parts: a hard plastic inner clamshell, with port and button openings and an outer rubber covering that slips over the plastic clamshell and seals up the openings with rubberized flaps. It's a great combo, because the hard shell protects the touch from impact and torque, while the rubber wrapper cushions impact and seals the touch's ports from the elements. The Defender's inner plastic clamshell also features a clear plastic cover for the screen, for additional protection from impact and the elements, though I found it made some selections near the edges of the screen a little tougher. This may be due to the Brando BW UltraClear Screen Cover on my screen, which I didn't remove. The inner clamshell is also a bit tough to separate and remove from the touch, but considering the seal it provides, I didn't mind an extra minute or two spent removing the clamshell in exchange for better protection. While at Winterblast weekend I put my touch in the OtterBox Defender and carried it in my pocket, never worrying about impact, torquing or abuse it might get while walking around the cold north woods at Fort Wilderness. It's one tough case. 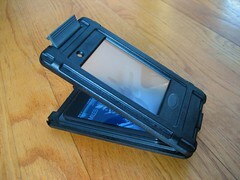 The OtterBox for iPod touch Armor™ case ($49.95) was created for some seriously extreme conditions. The iPod touch is sealed inside a hinged, two-piece, tank-like caase that's waterproof to 3 feet, dirtproof, sandproof and drop-proof. The OtterBox Armor case is quite a bit larger and nowhere near "pocketable" as the Piel Frama or OtterBox Defender, but hey, this thing provides some heavy-duty protection to an iPod touch. This is the case you'd climb Mount Everest with. The Armor's case closes with a plastic snap clip, and the back of the case features a plastic belt clip. Once the touch is inside, headphone access is provided by a sealed passthrough port, the screen is protected by a clear plastic shield, and there's a rubber button to activate the touch's Home button. I hope these reviews are helpful for those seeking a case to protect an iPod touch. This is only a small selection of protective case choices out there, so have a look around and do your research to find just the one for your needs. 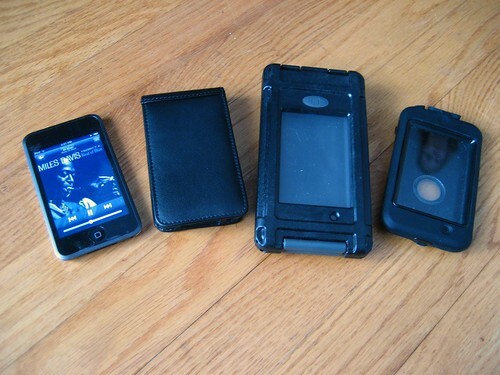 Many thanks to Piel Frama and OtterBox for sending over their cases for these reviews. Both companies have been extremely helpful with questions and communications, and they both have great products. I was able to get a clear plastic case over here in the UK. I think it was by Belkin and it provides protection for the back and sides. None for the front, but then again I have seen the youtube videos of people trying unsuccessfully to scratch the screens with keys and even knives! The case was �15 which seemed a bargain compared to what some others cost. Alastair, thanks for the comment. I think you are right on about the touch as a PDA � while not perfect, it had most of the things I need to make it an effective tool. The Palm had more depth of apps and was a little friendlier for text entry than an on-screen keyboard, since I spent the time learning Graffiti, but was a little bit weak on the web side of things. So, I find it's a different kind of PDA than a Palm, at least right now. I'm very curious to see how that changes when the SDK comes out for the iPhont/touch later this month. I hope to see a wide variety of apps pop up for these devices, just like the Palm. I am awaiting some kind of external keyboard to come out as a result of the SDK, assuming Apple will spec out the sync port. An external keyboard would make the touch even more useful for writing and email. As for cases: I like those clear acrylic cases, and looked at one initially. They are pretty good at not adding too much bulk. However, I really love the leather of the Piel Frama, it just adds something nice to the overall experience of using the touch, and makes it feel more like a PDA to me, since I preferred using leather cases with my Palm devices.